Join us for refreshments and live music, ongoing every afternoon. 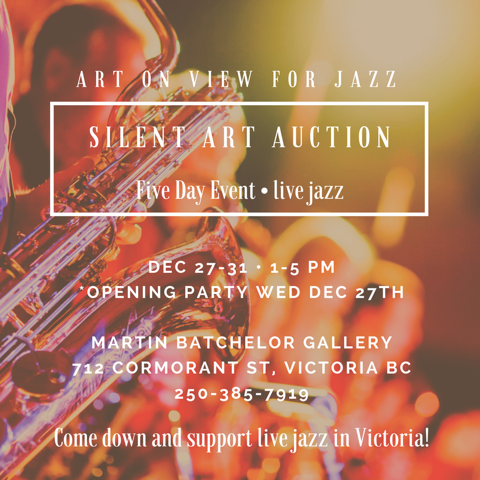 Come down and support live jazz in Victoria! While the initial attempt to purchase the building on View Street that is home to Hermann’s Jazz Club (the oldest jazz club in Canada!) was unsuccessful, we have decided to go ahead with our art auction in support of the Jazz on View campaign. Firstly, to keep it positive while the future of Hermann’s remains undecided and unclear. Secondly, as visual artists we appreciate and wish to acknowledge the incredible talent and dedication of the musicians that play at Hermann’s. We really love to hear music live, especially jazz, which is so spontaneous and lively. We know what it takes to be in the moment, in a creative flow, taking risks and responding to what is happening. The sharing of the experience with others is sheer joy. All the proceeds from this endeavor will be used to either preserve Hermann’s where it is or help relocate the ‘Hermann’s experience’ if need be, or support local jazz musicians (mentoring youth, scholarships, a musicians’ fund). We would like to warmly thank Martin Batchelor, who immediately and enthusiastically agreed to let us use his beautiful gallery, and for his help setting it up. A big thanks to all the artists who have so kindly and generously donated their artwork and to those who donated from their art collections to support live music here in Victoria. Thanks to our enthusiastic sponsors: Vancouver Island Brewery, Patisserie Daniel. Finally, thanks to all of you who have helped in any way to keep the music flowing!